Today I am going to be bringing you my hints and tips of how to stay organised while studying at University. These will also work if you are at college or sixth form too! I am one of those people who have to be completely organised while studying, I have a schedule of when things need to be done, and the process of which I complete everything, So I hope I can motivate some of you to stay organised this academic year while studying! Between being a student at University, having two jobs and this blog, life can sometimes be very busy and slightly stressful; so using my time to it's maximum potential is very important for me to feel more at ease. Firstly, you need to have some productivity in your life so these are my top four tips! 1. Make a list and tick things off once you have completed them. This may seem really basic and common sense but it really does work. 2. Get your least favourite task completely first, the rest will follow a lot easier. 3. You can also get the most important tasks complete done first too, that way you won't feel stressed when you only have a couple of jobs left to do but they're not that important. 4. Complete your work in stages, try not to do it all in one go as you need to give your mind a break. Have a coffee, grab a snack and come back to your work in 15-30 minutes. 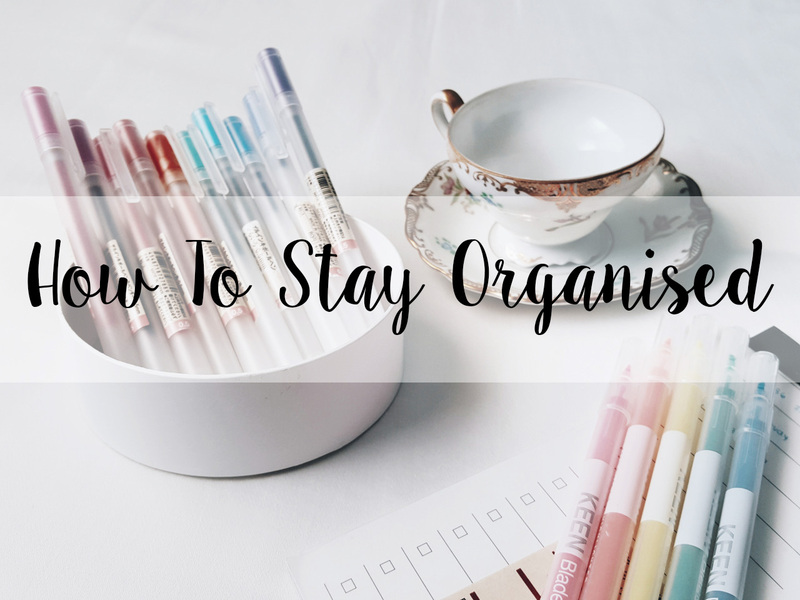 Now for my tips on how to actually stay organised. Tip One; Planners, diaries, calendars, lists. List writing is high up on my priorities for staying organised while at university and in general life. I write absolutely everything down and tick it off as a go just to keep my life in order. I also tend to forget things if I don't write them down as well. Not only will lists help you stay organised, but they will also give you motivation to achieve everything you have written down. Although this may sound simple, you also need to stay realistic with the goals on your list; don't write something down which you know you won't be able to complete. Also use diaries and planners to write down everything that's going on to keep your mind at rest. Tip Two; Tidy House = Tidy Mind. I find it very difficult to concentrate on what I am doing if the area around me is untidy. Therefore, I always try to ensure that my workplace or anything around me is tidy before I start the jobs on my list. My doing this, my house is tidy and so is my mind. I am able to concentrate easier knowing I have done all the housework before doing the jobs on my study list. When I first wake up in the morning I tend to spend half an hour tidying up in the kitchen or in my bedroom before sitting down for the rest of the day to complete my essay or whatever project I have on the go! Tip Three; Create a Routine. Anyone who is a blogger and also have a job knows how difficult it can be to find the time to blog, take pictures and do everything else which is involved in your general life. This is exactly the same as being a student. I know from my first year, finding time within my first month of University was absolutely ridiculous and I found it difficult even to see my partner. This is why trying to organise a routine will help your life in every aspect. I created my own planners which helps me to plan out my day, each day of the week so I can fit in everything that needs doing. I also carry round an academic diary which I write everything into; when I am working, when I have a blog post scheduled for, when my partner is working etc etc.. If I have been at work all day, I tend to do everything as soon as I get home so I can then sit down and relax for the rest of the evening without having to worry about things I need to do. Tip Four; Try to make the most of your day. If you have a day off from work or University, try to make the most of your day! I will always try and wake up earlier than usual on my days off to get as many jobs done as possible and out of the way so I can enjoy the rest of the day. University work can be very time consuming so if I have a day off during the week, I'll get anything done then so I can then enjoy my next day off doing anything that I want to do. I hope you have found these tips useful and will be putting some of these into practice once you are back at University or college. Let me know what you do to stay organised! Thank you for reading and I will see you soon!